Since it’s inception, Foundr has quickly become a top ranked 10 ‘Business & Investing’ Magazine in the AppStore and is currently supporting hundreds of thousands of entrepreneurs across multiple platforms and resources. 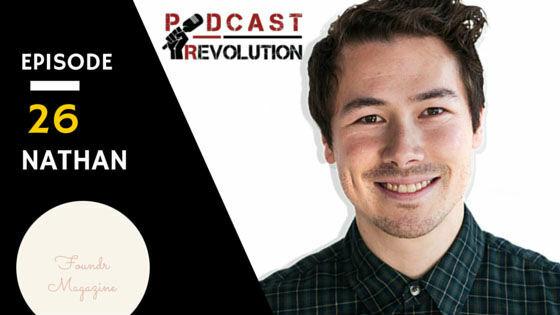 How and when did Nathan Chan started Foundr Mag? How podcast manages to do with his business? How podcast build community and trust? You’ve got to learn how to create epic content that the people want to share, the people want to follow. If you can build a community in anywhere, then you can do something with it. But I guess, it comes back to everyone wants to know how we rapidly grow it. I can see they talk about it all day. In fact we created a course; a step by step course and in my opinion, it’s the ultimate way to really screw yourself up. And you can find that course in igdomination. I recommend the people will go and check it out free ebook. It’s a great place to start. And if you go to http://www.foundrmag.com/free. I think the biggest things are one creating epic content then whatever niche you’re in and it has to be brilliantly design and you have to post I guess. The next thing is posting consistently. The more you post the faster you grow. We post newer from four to six times a day. And then the next big thing is using hashtags. Hashtags can be a massive game changer when it comes to growth. The last thing would be S for S. (Share for Share) (Shut out for Shut out) It’s about getting other accounts to shut you out. I’m really liking foundation by kevin Rose. That’s a very very good podcast. He’s the best. I did like Start Up and also I listen to all sorts of podcasts but the one that’s I’m listening to a lot now is the Foundation.